Let's do finishes first, shall we? I has been a busy week. I'm pretty surprised I got anything done! But the boyfriend had an exhausting couple of days and went to bed super early, so I had time to sneak back to my sewing room and get stuff done! Some of them aren't Christmas fabrics, but I think I covered my bases as far as colors go, at least! This little block is on its way to Australia! I had never sent anything internationally before and looked like a total n00b at the post office, but I was excited, anyway :) I hope it doesn't take too terribly long to get there! I really needed a bigger bag to take with me to work. I was getting really sick of carrying two- my purse and my lunch bag (that was usually just stuffed full of yarn). This one carries everything I need AND it's pretty. :D What more could a girl ask for?? I didn't follow a pattern. I used what I knew of bag construction to make something to fit my needs. The front and back panels measured 16.5" unfinished and I boxed the corners by about 3". I sewed a zipper pocket into the lining and did a much better job than I did on my Velocity Girl bag! Super proud of myself for that. But I do wish I'd had something other than a red zipper... I also added a magnetic snap closure. I wanted to do a recessed zipper, but I wanted to get it done without going to the store more, so I revised my plan. Here it is all stuffed with crap! This is without my yarn and my lunch. It gets pretty full with everything in it, but not uncomfortably so. It's juuuuust right. It turned out even better than I thought it would! And it was a good opportunity to practice my FMQ loops. I think they're getting a lot more consistent :) Must try new designs soon! I absolutely LOVE this bag! Okay. Now, are you wondering what I started? Well I can tell you, it is REALLY EXCITING. Yup, that's right! That huge mess up there will eventually be my very own SWOOOOON! AH! I love this pattern so much! As soon as I saw this, I bought the pattern and started going through my stash to see what I could do. Because I am broke (yay student loan repayment!) this really needed to come mostly from my stash. I sorted and sketched and mocked things up with the Quilt Design Tool and did a whole lot of math and! I can totally do it. I am going to use my precious Daiwabo elephant prints and a variety of solids to create... THE ELEPHANT SWOON. It has taken all my willpower to be responsible and do things like fill out loan consolidation paperwork and sleep instead of just working on this all the time... but soon it will be the weekend. And then (as soon as I finish the last of my stitch and flip blocks) it will be swoon time! YAY! So what do you say, wanna Swoon with me?? Click the button above for details! So that's been my week. How has yours been? Elephant swoon sounds like the best thing ever. And I really really REALLY love you elephant wallet... I've told you before but now I desperately want to make one. I'm really hoping that I can swoon too... I'm moving back to Richmond in a week and don't know if I can start anything right now. Hopefully in a week or two! I'll hopefully just be a few blocks behind everyone. Umm... can I say ditto to her whole first paragraph?! 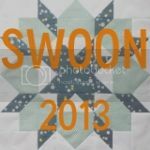 I would LOVE to do the swoon-along too but I'm worried work might take up too much of my sewing time :/ Still it's such a stunning pattern and I have gobs and gobs of fabric so I really should bite the bullet and join you :) We'll see, but nevertheless keep doing what you do, making amazing things! !